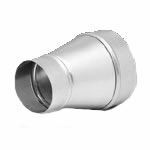 This increaser/reducer allows round ductwork to be increased from 4 to 6 inches, or decreased, which is sometimes necessary when you are exhausting from two locations with one in-line fan. It is made of galvanized metal. The actual diameter at each end is 1/8" smaller than the duct it would be secured to.